Posted on December 31st, 2018 in Dee Why. Weird sea fog lapping against Dee Why beach as of 0830 when I tried to get a picture of the conditions. Appears I’ll have to wait until later on that front, so for now all I can do is report on the data. At 0600 the MHL buoy was seeing only 1.2 metres at 6 seconds from the ESE. That’s down by 50% compared to yesterday, so my guess is that it’ll be barely possible to catch anything at Dee Why. When I grabbed the snap, the wind was just a breath from the SW. The forecast tells us we can expect it to swing N-NE as it comes up to a standard summer 15-20 kts later. Tide was high at 0445 and is currently running out to a 06m low at 1055. We’re headed to a high of 29C along the beaches and there’s a 40% chance of a shower by this afternoon. Have a great NYE and maybe check back later for an update pic. A high pressure system lies stationary over the Tasman Sea, extending a ridge towards northeast New South Wales and directing north to northeasterly winds over most coastal areas. This pattern will change very little during the next few days. A more persistent southerly change is likely to push into central parts of the coast early in the new week. North to northeasterly 15 to 20 knots, reaching up to 30 knots offshore during the morning. Partly cloudy. The chance of a thunderstorm during this afternoon and evening. North to northeasterly 15 to 20 knots, reaching up to 30 knots offshore early in the morning. The chance of a thunderstorm in the early morning. Mostly sunny afternoon. North to northeasterly 15 to 25 knots tending south to southeasterly 10 to 15 knots inshore. Northeasterly 1 to 1.5 metres, decreasing to around 1 metre during the afternoon. Posted on December 30th, 2018 in Dee Why. Warming up as we head to a high of 32 along the coast today. Wind was coming from the NW when I grabbed the pics at 0800, but it should swing to north before settling to the NE and ramping up into the 15-20 kt range. There were a few bods in the water at Dee Why chasing soft and gutless little knee to maybe waist high waves on an outgoing tide (low is at 0942). Not exactly crowded (which tells you something about the quality), but nice to be getting wet in the 21° ocean. Out at sea the MHL buoy was seeing 1.7 m of 7-sec stuff from the ESE along with the residual NE bump from yesterday’s wind. New Year’s eve and New Year’s day look like being similar to today’s conditions – ie soft and gutless little stuff for the early then blowing out in the afternoon. Beyond that, the long range models are not encouraging, although there does seem to be at least a hope of someting slightly bigger and jucier for Sunday-Monday (wind a factor of course). A high pressure system lies stationary over the Tasman Sea, extending a ridge towards northeast New South Wales and directing north to northeasterly winds over most coastal areas. This pattern will change very little during the next few days, although a couple of troughs will bring a southerly change to southern waters today. A more persistent southerly change is likely to push into central parts of the coast early in the new week. 2 to 3 metres, decreasing to 1 to 1.5 metres around midday. North to northeasterly 15 to 20 knots, reaching up to 25 knots offshore early in the morning and again in the late evening. Below 1 metre, increasing to 1 to 2 metres offshore. The chance of a thunderstorm in the morning. Mostly sunny day. Posted on December 29th, 2018 in Dee Why. Not as much activity as I’d hoped this morning. Looks to be maybe knee to waist on the better ones, but that may be a excessively hopeful. Wind was NNE 8-10 kts as of 0700, but the Bureau says it’ll be 20-25 kts N-NE by this afternoon. That ought to push up the waves but the biggest stuff will be the most blown out. Tide is low at 0830, so it’ll be dumnpy as well as small. By the time it’s back to the 1.6 m high at 1442, the wind should be at full strength. We’re going to a high of 30C today on the coast (up to 42 out west!) and water is sitting on 21C. Given the strong wind forecast, there might possibly be a little fun something for the early on Sunday. Outlook for the rest of the week is pretty ordinary – basically little to near flat and junky weak NE wind bump through the period. Summer surf in other words. Have yourself a fine old Saturday everyone! A high pressure system lies stationary over the Tasman Sea, extending a ridge towards northeast New South Wales and directing north to northeasterly winds over most coastal areas. This pattern will change very little during the next few days, although a couple of troughs will bring a southerly change to southern waters on Sunday. A more persistent southerly change is likely to push into central parts of the coast early in the new week. North to northeasterly 20 to 25 knots, reaching up to 30 knots offshore during the morning and again in the late evening. North to northeasterly 20 to 25 knots, reaching up to 30 knots offshore during the morning. Northeasterly 1 to 2 metres. Northeasterly 1.5 metres, increasing to 1.5 to 2 metres during the morning. Posted on December 28th, 2018 in Dee Why. NNE 11-16kts at North Head as of 0800 under light blue skies. The 0500 report from the MHL buoy showed 1.9 metres at 7.4 seconds from the SE (138°). Tide was low at 0725 and is now filling into a pretty swampy 1.73 m at 1340. We’re on track for a high of 30C today along the coast and the Bureau tells us it’ll stay above 30 until Wednesday, when they expect a dip into the high twenties. Ocean’s 21C according to Beachwatch. 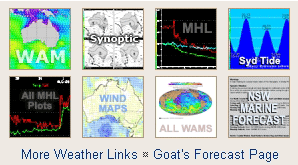 If you’re wondering about the surf week ahead, I’d advise referring to the Goat’s latest forecast – which in keeping with our traditions, also features his annual New Year’s message. Have yourself a fine old Friday everyone! A high pressure system lies stationary over the Tasman Sea, extending a ridge towards northeast New South Wales and directing north to northeasterly winds over most coastal areas. This pattern will change very little during the next few days, although a couple of troughs will bring brief southerly changes to southern waters today and again on Sunday. A more persistent southerly change is likely to push into central parts of the coast early in the new week. North to northeasterly 15 to 25 knots, reaching 30 knots offshore in the evening. North to northeasterly around 1 metre. North to northeasterly 20 to 30 knots tending northeasterly 15 to 25 knots in the middle of the day. North to northeasterly below 1 metre inshore, increasing to 1 to 1.5 metres offshore during the morning. Posted on December 27th, 2018 in Goat's Forecast. Warm days continuing into 2019. Surf pretty much as it’s been. Continuing short period North East windswell. Bigger at southern ends of beaches, where the wind will be heading but there are some light wind periods forecast by the Bureau. If you can get in the water count yourself lucky. If you can catch a wave count yourself lucky. Hey.. You’re Here and it’s Summertime.. count yourself lucky. Remember to keep an eye on the weather – couple of possible Thunderstorms are forecast. Thursday: around 1ish metres East. Stay safe ..stay cool.. stay hot.. stay well. Have Fun. Happy New Year from TG! Mostly clear. Winds northeasterly 15 to 25 km/h, increasing 25 to 35 km/h near the coast this evening. Hot and mostly sunny. Winds northeasterly 15 to 20 km/h becoming light early in the morning then becoming northeasterly 20 to 30 km/h in the late afternoon. Hot and sunny. Winds northeasterly 15 to 20 km/h becoming light in the morning then becoming east to northeasterly 15 to 25 km/h in the early afternoon. Hot and mostly sunny. Light winds becoming east to northeasterly 15 to 25 km/h during the afternoon then tending north to northeasterly during the evening. Partly cloudy. Slight (30%) chance of a shower. The chance of a thunderstorm, mostly in the outer west in the afternoon and evening. Light winds. Partly cloudy. Slight (20%) chance of a shower. Light winds becoming southeasterly 15 to 25 km/h during the morning. Partly cloudy. Medium (40%) chance of showers, most likely later in the day. Light winds becoming southeasterly 15 to 25 km/h during the day. Posted on December 27th, 2018 in Dee Why. Wind was out of the NNE at 6-9 kts as of 0850 and tide was coming into a 1.85 m high at 1245. Skies were cloudless and a bit hazy as we head to a high of 29 along the coast (the Bureau is again advising that Ozone levels are high across the Sydney region). Beach watch reports good water quality everywhere and a sea temp of 21°C. Noice. Have a top Thursday and keep on smilin’! A slow-moving high pressure system over the Tasman Sea will direct north to northeasterly winds along most of the coast for the remainder of this week. A number of weak troughs are forecast to affect the southern coast over the next few days, resulting in brief southerly changes. North to northeasterly 10 to 15 knots inshore at first, otherwise 15 to 25 knots, locally up to 30 knots in the evening. North to northeasterly 15 to 25 knots becoming northeasterly 20 to 30 knots in the evening. Posted on December 26th, 2018 in Dee Why. I’m jealous. Won’t be able to surf for another month, and we have fun chest plus sets rolling into Kiddies and the Point this morning. Quality is not remarkable, but as of 0830 when I grabbed the pics, the NNE breeze was a lazy 6-7 kts under warm and sunny skies. Classic summer conditions. 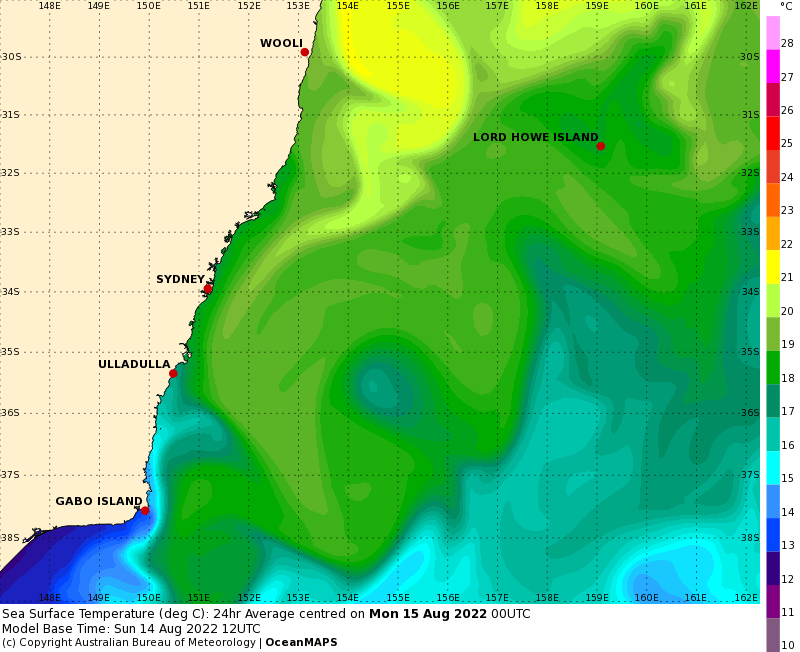 The MHL 0600 data showed 1.9 metres of 11.8-sec S-SSE (168°) swell. Tide is coming into a deep 1.95 m high at 1150 and by the time it’s back to low at 1835, the NE wind will be into it. I thought it looked kinda hazy this morning and it turns out that our air quality is rated as Poor today due to elevated Ozone levels, ie it’s going to be smoggy. I’d guess that once the wind comes up (forecast is for 15-20 kts NE), those of us on the coast will see air quality improve. Have a good Boxing Day one and all! A high pressure system in the western Tasman Sea is near stationary. Northeasterly winds, gusty about the coast in the afternoon. A weak trough will move over the far south coast late today, resulting in a brief shift to light southerly winds for some parts of the water. Winds will return northeasterly again on Thursday. Northeasterly 15 to 20 knots, reaching up to 25 knots offshore in the evening. North to northeasterly 15 to 25 knots becoming northeasterly 25 to 30 knots in the evening. Posted on December 25th, 2018 in Dee Why. But lo, is that a line…? Classic summer day coming up for Christmas. When I eventually climbed aloft to grab the pictures from the RealSurf crows nest, the wind was just beginning to puff lightly from the NNE. Skies were clear and in the direct sun it felt like we were already at the predicted 29 high for today. Bet it goes past that mark. Down at Dee Why there were hopeful surfers bobbing about at Kiddies and thereabouts. Didn’t see anyone up the beach toward No Mans, and the point was untroubled by board-equipped types. The heat shimmer took a toll on the picture quality, but though distorted, one can see there are little lines. I’m thinking knee with the odd plus. The MHL buoy was seeing 1.3 metres of 10-sec stuff from the SSE-SE (154-162°). Tide is coming into a deep 2 metres at 1100 and then falling away to pretty low 0.15 m at 1740. By the time it’s bottoming out, the wind should be puffing along at a standard summer issue 15-20 kts. Boxing Day looks kinda like today and so does Thursday, but on Friday it might possibly push up a bit at spots that like NE wind swell. It also looks as though the wind might be into it more or less from the get-go. Beyond that, the predictions currently are for no major change – up a bit and down a bit as the Goat is wont to say. Have a top old day everyone! A high pressure system in the western Tasman Sea is near stationary. Northeasterly winds, gusty about the coast in the afternoon. A weak and brief southerly change is expected about the far south coast on Wednesday before winds turn northeasterly again on Thursday. Northerly 10 to 15 knots turning northeasterly 15 to 20 knots in the early afternoon. Posted on December 24th, 2018 in At large. What a stunning start to Christmas eve. Light breezes, sunny skies, mild temps and, despite a big high tide, some waves to go with it. I checked Curly and Dee Why this morning and can report that as of 0820-0830, the former was the pick. Waves at south Curly were into the chest range on sets, while around at Dee Why it was struggling to make waist high at Kiddies. Didn’t really study the Longy end, but I’d guess it would be maybe a touch better. Wind was offshore when I looked and the Bureau tells us it should stay reasonably benign all morning before turning light NE in the afternoon. The MHL buoy was showing 1.4 m at 8 seconds from 152-154° (SSE) as of 0600. Tide is coming into a very swampy 2.02 m at 1010. It’ll then drain rapidly away to a 0.15 m low at 1650. Weather is set to be toasty and sunny all week with temps along the coast near the 30 mark from tomorrow through to next weekend. Looking at the surf prospects, I see no reason to update yesterday’s call for standard issue summer conditions, ie NE wind building up in the afternoons and clean but potentially tide-affected knee to waist high short period wind bumps for the early sessions. Posted on December 23rd, 2018 in Dee Why. Beautiful sunny morning at Dee Why for Sunday. Wave faces looked to be in the waist to shoulder high range along the beach – and a bit smaller at the point. The MHL Sydney buoy was seeing 2.9 metres at 9 seconds from the SSE (156-158°). Wind was coming lightly from the SW at 7-8 seconds, but it should swing south and come up to 15-20 kts. Tide hits a swampy 1.98 m high at 0920 and will be back to a lowish 0.17 m at 1600. It’s set to be a mild 23 today and according to Beachwatch, the ocean is up to 21°C. Water quality is dodgy at Collaroy, Longy, North Curly and the entire Manly stretch. Outlook is for the wave energy to back off a little overnight, but I’m hopeful on your behalf that there will still be some fun little morning sessions tomorrow and Christmas day. The models show us moving into a summery pattern of brisk afternoon NE wind for the next week or so. At least there should be little bumps for the early sessions and some bigger stuff for those rare types who don’t mind wave hunting in onshore conditions. Fresh southerly winds along the coast today will ease in the south as a high pressure system over the Bight extends a ridge over southern parts of the coast. As the high drifts further east, southerlies will begin to ease on Sunday and then winds tend northeasterly during Monday or Tuesday. A weak and brief southerly change is expected about the far south coast on Wednesday. Southerly 15 to 20 knots, reaching up to 25 knots offshore during the morning. Winds decreasing to about 10 knots in the late evening. Southerly 1.5 metres, tending southeasterly 1.5 metres by early evening.